Cut a piece of yarn about 24 inches long. Fold in half and insert the looped end into the hole of the backpack ring. Run the open ends of the yarn through the yarn loop and pull tight to secure. Thread pony beads onto the yarn and tie the two ends of yarn into a knot. 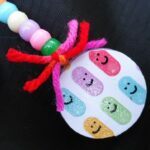 Draw smiley faces onto your scrapbook paper and place podgeable plastic circle over the smiles, trace around the circle. Do this twice, one for each front and back. Allow the marker to dry for about 20 minutes. Cut the circles out, trimming a small amount off the entire circle so that there are no edges hanging over the plastic once attached. Paint an even layer of decoupage medium onto the plastic circle and onto the back of the paper. Attach the paper to the circle and let dry 10 minutes. Repeat on the other side and let dry ten minutes. Apply a layer of decoupage medium over the top of the paper, let dry and repeat on the back. Run one end of the yarn through the circle’s hole and tie into a bow. Cut the loops of the bow. Trim all ends. This project for Smiley Backpack Tag was printed from CraftsbyAmanda.com - https://craftsbyamanda.com/smiley-backpack-tag/ and can only be printed for education or personal use.